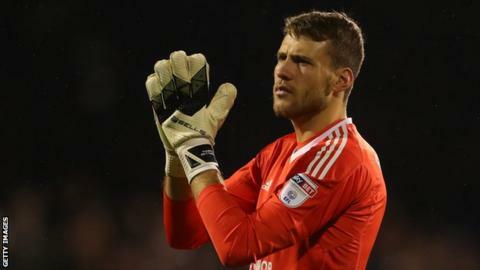 Fulham goalkeeper Marcus Bettinelli believes their youth could benefit them in the Championship play-off final. The Whites face a more experienced Aston Villa side at Wembley on Saturday for a place in the Premier League. "I don't think many of the lads have been to Wembley before," the 26-year-old told BBC Radio London. "But I think the reason we play so well and score so many goals is because we have lots of energy and can keep going right until the end." The average age of Fulham's starting XI for the second leg of their play-off semi-final against Derby County was 25 years and 292 days, while Villa's was 29 years and 69 days for their tie at home to Middlesbrough. Villa's squad is full of Wembley 'veterans', with former Chelsea and England captain John Terry having made regular appearances at the national stadium, and keeper Sam Johnstone and midfielders Conor Hourihane and Robert Snodgrass among several others who have won play-off finals. Boss Steve Bruce has won four promotions from the second tier - two of which were through the play-offs - to Fulham boss Slavisa Jokanovic's one, which came with Watford in 2014-15. Fulham spent 13 years in the Premier League before being relegated in 2014. The west London club were beaten in the play-off semi-finals last season but, after missing out on automatic promotion by two points on the final day of this campaign, booked their place at Wembley by beating Derby 2-1 on aggregate. Figures from Deloitte suggest promotion would be worth about £170m for Fulham, with that figure rising to £280m if the Cottagers were to survive a season in the Premier League. Fulham supporters staged a pitch invasion following their play-off semi-final win over Derby County, with Bettinelli describing the event a "special night"
Bettinelli says the players are fully aware of the "massive importance" of the encounter with Villa, but hopes they are able to play their normal passing game. "We have been at our best this season when we have focused on how we play and going forward and attacking," he said. "That is how we have won most of our games this season. "When we get there on the day and you are in the stadium the boys are going to be nervous. But Villa are going to be nervous - it is just the nature of the game. "After the first 10 or 15 minutes the game will settle down, we will play our football and hopefully we can come out on top." Bettinelli established himself as Fulham's number one in December, taking over from David Button, and kept 11 clean sheets in the 23-match unbeaten run which lifted Fulham from 12th to third in the table. He is comfortable with the pressure he may encounter on what will be Fulham's first Wembley appearances since losing the 1975 FA Cup final to West Ham. "Of course goalkeepers play a vital role in finals and could be the difference of whether you win or lose," he said. "You can make a mistake and cost your team but you can save a penalty in the last minute and win the game for your team. "I am not putting too much pressure on myself as I'm proud of what I've done this season. "You don't get many second chances in football so we are all well aware of what the game means to the club and the fans. It will be tough and tight but everyone is confident we can do it based on our ability."